I’ll admit, gifting is hard. Unless gift-giving is your love language you probably, like me, struggle with it. How do you choose that perfect gift? Mom does not need another nick-knack sitting around the house. As much as my mom loves birds after the 30th ceramic bird statue, birdhouse or other bird decoration we bought her as a gift she was starting to look like a crazy hoarder! None of us blamed her when she decided to clean and de-clutter and most of those decorations went away. But the one things she always hangs and keeps up are portraits of her grandkids! So here are 5 ways to gift portraits this year. These are perfect whether you are a mom yourself looking for a gift for your mom and mother in law or you are a husband looking for a gift for the mother of your children! I love a canvas print for mom for those images that she will want to hang forever. Newborn portraits or that family image that came out so perfectly are the types of images I recommend for this. These are images that you aren’t going to want to replace. Canvas is also perfect because she won’t have to go find a frame to hang it. NEVER give mom a gift that will require more work! For those of you who have been following me for a while, you have probably figured out that the heritage wood prints are my FAVORITE product! Choose a wood print for the same reasons you would choose a canvas, images you are going to love forever, and a ready to hang print. I personally love the timeless look of the sanded wood edge and the beautiful linen finish print which is why I chose these for my son's newborn portraits. #3 Legacy photo locket - On Sale in April 2019!!! Why do I love these so much? 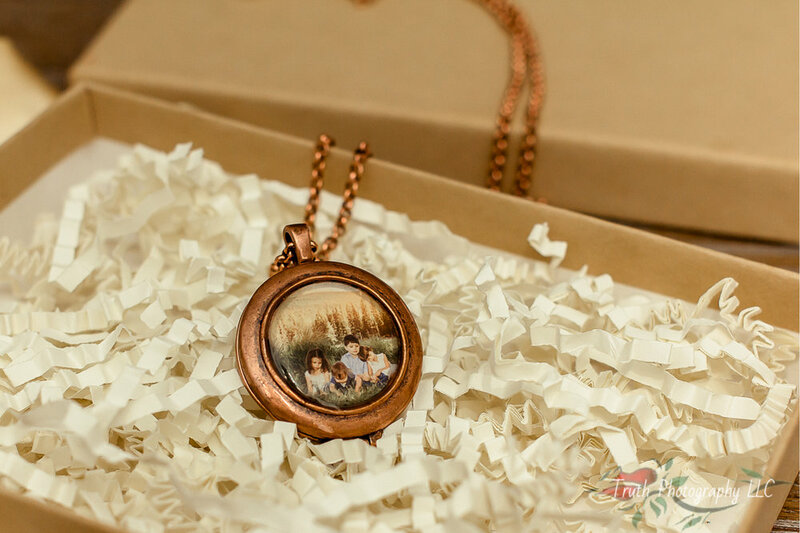 I love that they are a classic photo locket with a twist. They include one permanent photo on the front and two that can be changed on the inside. I love the photo on the front because unlike a traditional locket you don’t have to open the locket to enjoy a beautiful photo! These are perfect for the mom who is running out of wall space or who you want a more unique gift for! The wood keepsake box is another great option for the mom who is running out of wall space. The keepsake box comes with 30 images however it can hold up to 350 loose 4x6 prints so she can add her own favorites or order a set from future photo shoots! #5 The photo shoot is the gift! I know what some of you are thinking. These all seem like great gifts but what if we don’t have amazing photos to use to create these gifts. No problem! Give the photo shoot as the gift! If you are in the Denver Colorado area I would love to be your photographer for a special mothers day shoot! There are several ways to do this. You can book a Limited Edition Bloom session for April for either the whole family or just the kids if you want to have the images back in time to give to her for mothers day OR you can pre-book a session for after monther’s day (choose a date for her or just prepay and let her choose from my available May, June and July dates) and I will send you a certificate to give her on Mother’s day to let her know you’ve reserved a session for her! I can guarantee that family portraits are a gift that your mom, or wife, will not forget and will cherish for a long time! would love to help you out with your mother’s day gifts no matter what option you choose! To contact me for details and to book please use the contact button below! My name is Jennifer Tavera, the photographer behind Truth Photography. I am a Northglenn Colorado family photographer and gallery designer seeking adventurous, free spirited families. I believe that your life is epic and deserves to be captured with photography! I specializes in creating unique photo sessions that will be an adventure for your child or family and turning the finished portraits into beautiful wall art for your home. I can’t wait to photograph your next adventure! !